We aim to read your water meter every 90 days for the purposes of billing water consumption. You can see the date your meter was read at the top of page two of your bill. If we can’t read your meter, a card will be left in your mail box to explain the reason why. This card also allows you to provide your meter reading to us by mail for the purposes of billing water consumption. 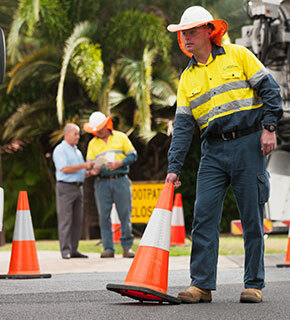 If you require assistance getting access to the meter, please call us on 13 26 57 (7am - 7pm weekdays). If you find bees in your water meter, please do not kill them as native bees are protected. We will remove the bees from Queensland Urban Utilities owned meter boxes only. If the meter is not owned by Queensland Urban Utilities, you can arrange safe removal of the bees by visiting the Queensland Beekeepers’ Association website. Water meters are usually located on the nature strip outside your property; your water meter will be set in the ground in a blue or black box. Please keep in mind that if you live in an apartment, unit or townhouse complex, you may not have individual meters for each residence. If you need help locating your meter, please contact us. Taking a reading of your water meter regularly can help you monitor your usage. It can also help you identify leaks either inside your home or underground.